MIAMI, August 28, 2018 – The Korean War took a toll on both their fathers decades before they met on the front lines of a very different battle fought on American soil. Marsha Latham and Gina Queen each grew up to become social workers fighting for America’s homeless veterans. 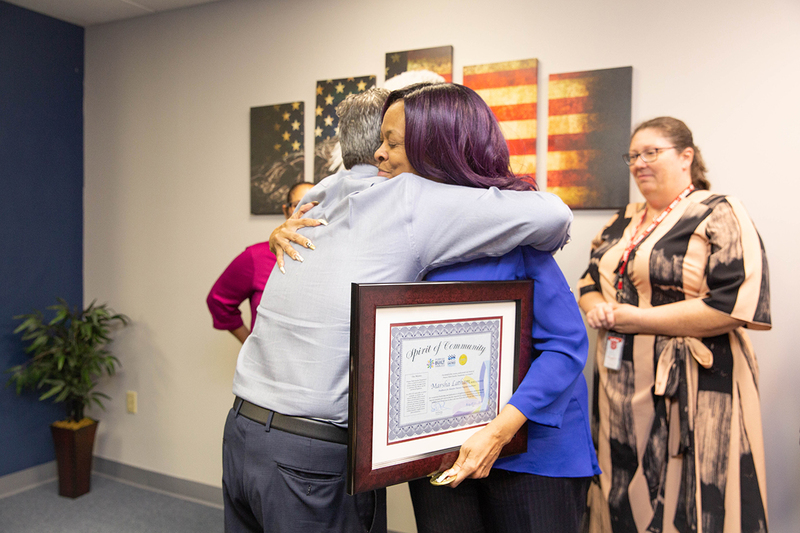 Last week, the two Miami VA Medical Center professionals found out they had more in common than they knew while being honored with Spirit of Community awards from Purpose Built Families Foundation. “It is only through dedicated, great team players and leadership in collaboration that a city of this magnitude could realize such achievements for the veterans we serve,” said Julie Macias, Deputy Program Director of the Operation Sacred Trust Supportive Services for Veteran Families program, as the two Healthcare for Homeless Veterans professionals were recognized for their impact disrupting veteran homelessness in Miami-Dade County. While just 29 of thousands of homeless and at-risk Veterans assisted by Operation Sacred Trust in Miami since 2012 were Korean War Veterans, many of the children born to the 1.8 million Americans who served in Korea between 1950-1953 were inspired by their parents’ sacrifices, said Purpose Built Families Foundation CEO Seth Eisenberg. Success in Miami-Dade County does not mean a moment to pause in the fight for America's homeless and at-risk veteran families. We owe the same sacred trust to every veteran. “Gina and Marsha grew up across the nation from each other in very different circumstances. The Korean War influenced both in their service to veterans,” Eisenberg remarked. With federal funding from the VA and actively supported by VA professionals in Miami, Operation Sacred Trust was established in 2012 as a collaboration of Carrfour Supportive Housing, PAIRS Foundation and University of Miami to deliver rapid rehousing and homelessness prevention services to very low-income veterans in Miami-Dade and Broward counties. In 2017, the program was nationally accredited. Earlier this month, HUD Secretary Ben Carson visited Miami to commemorate the community's success disrupting veteran homelessness. While there will continue to be veterans in need of assistance, “when homelessness happens … it should be brief, rare and non-recurring,” Dr. Carson said as he announced Miami-Dade County had met HUD standards for declaring an end to veteran homelessness. Success does not mean a moment to pause in the fight for America's homeless and at-risk veterans. Affordable, permanent supportive housing that prioritized homeless veterans was key to success in Miami, Eisenberg said, pointing to Carrfour Supportive Housing’s recent completion of two new affordable housing communities in the area. “Carrfour’s ability to win competitive state tax credit funding to develop, build and open Karis and Liberty Village apartments to dozens of formerly homeless veterans made this achievement possible,” he said. “The public-private collaboration with VA enabled our community to come together to create and deliver the resources veterans have earned,” Eisenberg said. “We owe the same sacred trust to every veteran,” he said.